The number and nature of the backlinks to a website is one of the most important ranking factors, that is still being used in today's user-oriented organic search results. It helps determining the popularity of a website. Rank metrics, such as Google PageRank and Moz Domain/Rank Authority use it for ranking websites. So the more backlinks you have (quality ones, not cheap and spammy ones that people often purchase), the better your site tends to perform in search results. Knowing what your backlinks are, and where they're coming from can provide you with useful insights, and can help you filter out the cheap links in favour of quality ones. Let's take a look at how you can look at your website's backlinks in Google Analytics. What can you do with backlink analysis? Backlink analysis can be invaluable for the performance of your website in search engines. The first and most useful information you could gather from your backlink data is the amount and nature of broken links. External links might be pointing to a page on your website that you have moved or deleted. Hence, the backlink is going useless, unless you do something about it. You can also check out the trends, and see what type of pages are being linked by other website. In other words, you can find out what people like about your website, so much so that they are linking to it. You can use this information to glean trends data, and create more such content. Another very important insight can be seen from the type of websites that are linking to you. For example, if a high quality website has given you a backlink, you should investigate, and find out what and why they liked. You can then stay in touch with them and maintain high quality connections that will ultimately help your website's ranking. Google Analytics offers one of the tools you can use to analyze your backlinks. To use this tool, follow these steps. Log into your Google Analytics Account, and then click on the website property you want to see backlinks for. Look to left sidebar, and there you'll see a Standard Reports section. Click on the Traffic Sources tab, expand the Social section, and then click on Trackbacks. A trackback is basically a notification for every time a website links to another. It is a record of what page on one website linked to another page on another website. Each trackback in this case will contain the linking URL, and the linked URL. You can also see how many visits were generated as a result of each backlink, so that you can contact that website and arrange for more backlinks to increase your traffic! Now, you will see a list of all trackbacks to your website within a specific period of time. You can change this period, and show backlinks from a month ago, or a week ago, and so on. This feature is useful when you want to see how many backlinks you 'scored' during a particular campaign. Got any questions? Feel free to ask in the comments section below. Also tell us what tools are you using for your backlink profile analysis? Wow Qasim Bro now we could easily find out where our valuable back-links is placed we could easily find our and make more back-links there.....thanks for sharing this tricks. Hi I am honor of teachonly.com and i have got more exciting thing from MBT well you can consider me as newbie i have created hindered of backlinks through free 2500 backlinks creator but when I check in any backlinks checker tool there is no result founded. some body do me help why ? Reason only i am new my blog age is 1 month 22 days. Just try to build backlink manually. Most of free tools won't work. Thanks for sharing this, I check for a lot of things in Google Analytics, but hadn't thought about backlinks. Great Tips to check our quality backlinks. This is great! But Colibri tool is great as well.:).. 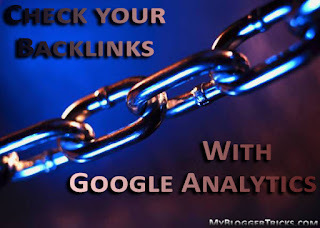 Like analytic tools it can check your backlinks as well as monitoring it. I love analytic tool and colibri. Well All good For us Thanks......!